Protons are subatomic particles that carry a positive charge. They are substantially heavier than electrons (roughly 1,836 times heavier), and carry a positive charge equal in magnitude to that carried by the electron. 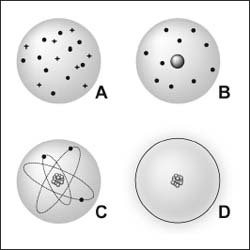 Protons are found in the nucleus of every atom, and the number of protons present in an atom determines its chemical properties (or, in other words, determines what element it is). Theoretical models of the atom have evolved over time, including A—the Thomson model (a mix of particles with positive and negative charges), B—the Rutherford model (a positive nucleus surrounded by electrons), C—the Bohr model (stating that electrons follow defined orbits around a nucleus), and D—the quantum mechanical model, based on the idea that you can only determine the probability of an electron’s location.